This is an incredible handy overclock utility for MSI graphics cards. Afterburner is powered by our own Rivatuner engine, but this software comes with a few extra's. 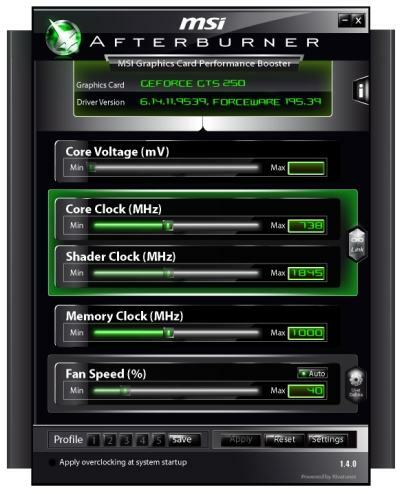 AfterBurner will support both ATI and NVIDIA graphics cards, Voltage regulation on the GPU, overclocking on core, shader and memory domains, GPU load levels (ATI), fan speed adjustment, device information .. and a really wicked graphical (configurable) monitor.